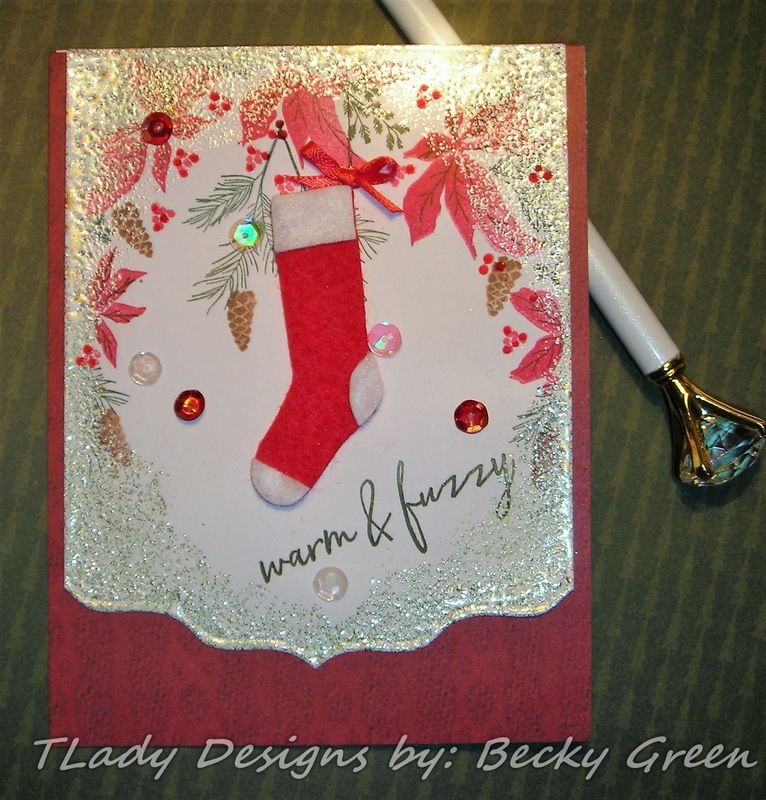 TLady Designs: PTI- Make It Monday #344- Deck Your Dies! PTI- Make It Monday #344- Deck Your Dies! I follow Melissa's blog & I have to tell you, she comes out with some GORGEOUS CREATIONS! One can learn so much from a person of talent like Melissa! This will be a card for someone who LOVES socks! And who doesn't love a Christmas Stocking? First of all, the designer paper I used looks like knit material- the red paper. What is more cozy & fuzzy than knits? I used PTI-To The Point Edgers II & PTI- Pleasing Envelopes to create the top panel. along with Hero Arts- EP to create a frosty edge around my focal point--"decking out my die!" My focal point is done with PTI- Warm & Fuzzy Stamps & Dies. I cut the little stocking from felt, "decking out my die" again! Lastly, I added 28 Lilac Lane Sequins & Nuvo Crystal Drops. HOPE you like & find some Warm & Fuzzy Socks to wear, or to hang up over your fireplace! So cute! I love how you used the felt for your stocking! I also love that you incorporated your to the point edger. I need to use my Edgers more often. Thank you for the inspiration!! Such a beautiful card, I love the shimmer and how nice you were able to capture it in this photo. Your gorgeous Point Edger die sparkles so fabulously. Just a perfect framing for that darling felt stocking! So very festive, and totally agree with Marybeth, how great is your photo! You captured all the shine and shimmer! Oh my, this is stunning Becky! The frosty edge you gave your image really makes it stand out. Such a lovely deisgn too! This is pure delight! What a lovely card. Your little stocking is simply perfect...warm and cozy and inviting. And I love all the shimmery sparkle! Cheers. Oh, Becky, this is a stunning and so beautiful card. The PTI edger die cut frame is marvelous and I love all the sparkle. The stocking is beautiful with the poinsettias, pine, and pine cones stamped around it. You certainly decked out your dies! Hugs! How gorgeous is this!!! I love this shimmery beauty, Becky, with its swag of Christmas greenery with poinsettias and that pretty red stocking!! I love the frosty border around your card. Lovely flowers and colors surround that fun stocking....really pretty! Lovely card! Love the border and your overall design! This is Gorgeous!! I love every detail!! Your stocking is perfect in red felt!! Gorgeous edging of that neat die--one I might have to get! Lovely card! Thank you for stopping by, I enjoy hearing from you & hope to see you again soon!